On Thursday, 8 November, ICVA and PHAP organized the first session in the learning stream on the Navigating change. The discussion provided an overview of the concept of localization in the humanitarian sector, how it has evolved, and how it is currently used. Participants learned more about how governments, private donors, the business community, and diaspora actors see current opportunities, trends, and challenges. The potential impact of localization initiatives on principled and effective humanitarian action were also examined. The event featured Dr. Rahmawati Husein, Advisory Board, Indonesian National Disaster Management Agency (BNPB), Firzan Hashim from Asia-Pacific Alliance for Disaster Management Sri Lanka, and Rabiah Nasir-Habeeb, Trustee, Foundation for Refugee Economic Empowerment (F.R.E.E). This webinar is part of the “Navigating Change” Learning Stream which includes a total of six webinars, briefing papers, and other resources. “Localization Examined: An ICVA Briefing Paper”, ICVA, September 2018. All practitioners interested in humanitarian policy issues, particularly NGO staff. 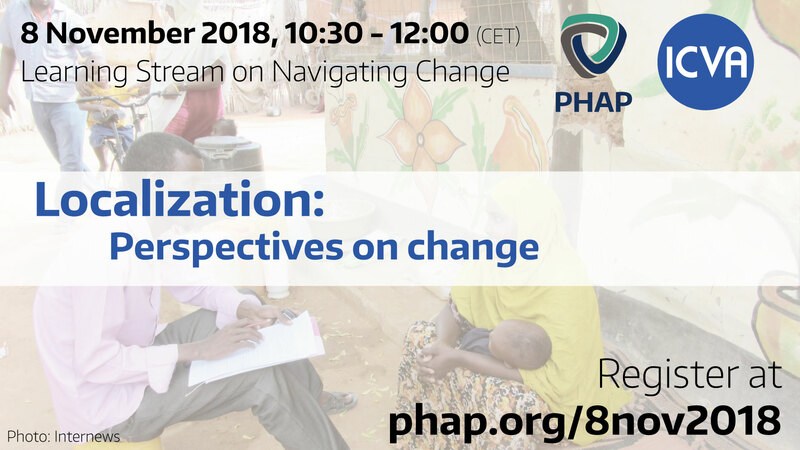 As part of the learning stream on Navigating Change, this event will be the first session of six live interactive online learning events that ICVA and PHAP will be organizing in the coming months. The purpose of these sessions is to provides a platform for the NGO community to better understand changes affecting the humanitarian sector. The event will address some aspects of segments 1.4, 1.5, and 2.6 of the certification assessment outline. This is the first webinar in the Navigating Change Learning Stream. Register today!